— The fissures emerging in both parties are evident in Ohio as the state holds its primary next week on May 8. — The likeliest matchup in the state’s open-seat gubernatorial race is a rematch of 2010’s battle for state attorney general, as former AG Richard Cordray (D) and current AG Mike DeWine (R) remain the favorites to win their respective party nominations. But upsets are possible on either side. — Democrats may have the wind at their backs even in Ohio this fall, a state that moved significantly to the right in 2016. But if Democrats can’t win in 2018 in Ohio, when can they? COLUMBUS, OH — It may be that Ohio, the great bellwether state, is moving away from the nation’s center in presidential elections. For the first time in more than a half century, the state’s popular vote outcome was not close to the national result in a presidential election: Donald Trump won the state in 2016 by eight points while losing nationally by two, giving the Buckeye State a significant Republican lean after decades of exhibiting only a slight such lean. Assuming Trump is on the ballot in 2020, he would likely start as a favorite to retain Ohio’s electoral votes unless his national standing significantly erodes over the next couple of years. — Two competitive gubernatorial primaries that highlight familiar fissures in both parties. — An open-seat gubernatorial race in the fall that Republicans are trying to defend against what should be a vigorous Democratic challenge. — A Trump-state Democratic incumbent senator facing reelection. — A battle for the leadership of a Republican legislative caucus. — More than a little whiff of scandal, which benefited Democrats nationally and in Ohio in 2006 and hypothetically could do so again. — A special House election that may give us another important data point on the road to November. — Democrats disadvantaged by Republican gerrymandering attempting to make gains on an unfriendly map at the federal and state levels. Let’s start where voters in November will start, at the top of the ticket in the gubernatorial race. Coming off his second term as state attorney general, Mike DeWine (R) has been a clear frontrunner to be the GOP’s gubernatorial nominee for the past several years. DeWine, a former U.S. senator (1995-2007) who has held posts at all levels of government, started the primary season with three major challengers: Ohio Secretary of State Jon Husted (R), Lt. Gov. Mary Taylor (R), and U.S. Rep. Jim Renacci (R, OH-16). The attorney general has faced criticism in the past from conservative activists for various perceived apostasies, such as backing a deal over judicial confirmations during the Bush administration and being insufficiently pro-gun for some during his tenure in the Senate. But DeWine’s time as attorney general has allowed him to repair some of these relationships, particularly with pro-gun forces. Still, there was an opening for another candidate to challenge DeWine in the primary, particularly in an era where a long public resume may be more of a detriment than an asset in Republican Party primary. During the time of the four-way primary, which was the state of affairs for most of 2017, most analysts thought that Husted was DeWine’s biggest threat, with Renacci as a sneaky dark horse. Taylor, meanwhile, was almost universally derided as the least likely of the four to win the nomination. In what at the time seemed like a masterstroke, DeWine persuaded Husted to join his ticket as its candidate for lieutenant governor, eliminating DeWine’s seeming top rival. Husted also gave the older DeWine (who is 71) a younger (50) running mate who is also an excellent fundraiser and who shares DeWine’s long experience in government (Husted has been secretary of state for two terms and also served in the state Senate and House, where he led the body as speaker). Many years ago, DeWine made the same decision as Husted: In the 1990 election cycle, DeWine dropped out of the gubernatorial race to become George Voinovich’s (R) lieutenant governor running mate, and the pair went on to win the GOP nomination and the general election that November. Bob Taft (R), a future governor, did the same thing that cycle, opting to run for secretary of state instead. Strategic field-clearing is a common and often-successful staple of recent Ohio Republican primary history. But then there was another curveball. Earlier this year, Renacci replaced state Treasurer Josh Mandel (R) as the party’s likely Senate nominee after the latter dropped out, citing his wife’s health problems. That reduced the gubernatorial primary race to just DeWine vs. Taylor. Taylor has since doubled down on support for President Trump and is trying to get to DeWine’s right by attacking him as a career politician (even though Taylor is the sitting lieutenant governor and served as state auditor and as a state legislator before that). The state party officially backs DeWine, further fueling Taylor’s outsider argument. There isn’t much polling of the primary, although DeWine has led big in every poll we’ve seen. However, the size of that lead may be shrinking. One independent poll of the race, from a group affiliated with state Republican lobbyist Neil Clark, showed DeWine up 54%-14% on Taylor in January but only 43%-26% in early April. The scary possibility for DeWine is that the field that he helped whittle down to just two candidates, him and Taylor, has consolidated the anti-DeWine vote behind one candidate, Taylor, and that could threaten him. A TV air war between DeWine and Taylor has been expensive and tough. It may be that DeWine does not actually feel that threatened but is leaving nothing to chance, which is not a bad way to approach a campaign. Some observers, including some who are otherwise not supportive of DeWine’s candidacy, still foresee him scoring a blowout win next Tuesday. A DeWine primary victory on May 8 remains likely, but if Taylor springs the upset, the trendline in the aforementioned poll might have been instructive in advance. This may be reminiscent of the recent Illinois gubernatorial primary, where at least one poll picked up on incumbent Gov. Bruce Rauner’s (R) weakening position against insurgent state Rep. Jeanne Ives (R). Rauner ended up only winning by about three percentage points. The aforementioned Ohio poll picked up a positive trend for former state Attorney General Richard Cordray (D), the incumbent DeWine defeated by a little more than a point in 2010, in his primary battle against former U.S. Rep. Dennis Kucinich (D), also a former mayor of Cleveland. Cordray, most recently the director of the federal Consumer Financial Protection Bureau, was up 28%-13% after the previous poll showed a smaller 23%-16% Cordray lead, although a huge number of undecideds means the race could break in unexpected ways at the end. The Ohio Democratic primary unfolded in two stages, pre-Cordray and post-Cordray. Throughout much of 2017, there were four credible contenders for the Democratic nomination: state Sen. Joe Schiavoni, Dayton Mayor Nan Whaley, former U.S. Rep. Betty Sutton (who Renacci beat in a member vs. member showdown in 2012), and former state Rep. Connie Pillich. A fifth Democrat joined the fray later in the year: now-former state Supreme Court Justice Bill O’Neill, who is best known nationally for a totally off-color Facebook posting questioning the #MeToo movement. Cordray’s entry forced Whaley and Pillich out, and Sutton joined his ticket. That left just O’Neill and Schiavoni, an up-and-comer from the Youngstown area who has many fans in Democratic circles but who has struggled to raise money and generate attention. Filling the vacuum as a Cordray alternative, though, came Kucinich, who has attacked Cordray for his past support from the National Rifle Association. Kucinich campaigns wearing an “F” lapel pin, indicating his past rating from the pro-gun group, while Cordray got an “A” in his race against DeWine in 2010. The most recent NRA report card has DeWine as a B, Taylor as an A, Cordray as a C-, and Kucinich as an F. It seems clear the NRA will be on the side of the GOP nominee this time, although Cordray has stopped short of calling for an assault weapons ban, a position that puts him at odds with many other Democrats, including his running mate, Sutton. There is an insider-outsider dynamic in the Cordray-Kucinich race that is tempting to compare to the Hillary Clinton vs. Bernie Sanders primary: Certainly state and national Democrats prefer Cordray, just like they preferred Clinton. Kucinich, meanwhile, has struggled with a recent story involving a paid speech he gave to a group that is apparently sympathetic to Syrian President Bashar al-Assad, and Kucinich also has defended the Syrian regime in the past and met with Assad. We heard from several sources who follow Ohio politics that this story, shared widely online in Democratic circles, hurt Kucinich and blunted whatever momentum he may have had in the race. Kucinich returned the $20,000 he received for the speech, a perhaps telling sign of damage control. Kucinich also has been complimentary of Trump at times, both from a recent perch at Fox News and elsewhere. In a sense, Kucinich and Cordray are emblematic of their respective home cities: Cleveland, like Kucinich, is brash, combative, and in your face. Columbus, like Cordray, is staid, managerial, and consensus-oriented. Cordray himself, to use the word of one observer who has questioned his campaign style, can come across as downright passive. Franklin County (Columbus), which recently eclipsed Cuyahoga County (Cleveland) as the most populous county in the state, soon will pass it as the state’s largest source of votes. Cuyahoga will cast more votes in the Democratic primary, though, and Northeast Ohio remains the most vote-rich of the state’s six regions: in all likelihood, nearly half of the total Democratic primary votes will be cast by the 20 counties included in the Northeast Ohio region, as defined by the Ohio Politics Almanac. In both the 2008 and 2016 presidential primaries, Northeast Ohio cast about 45% of the total Democratic presidential primary vote. A fundamental problem for Kucinich may be that the other two main candidates in the race, Schiavoni and O’Neill, are also from Northeast Ohio (O’Neill from the eastern Cleveland suburbs and Schiavoni from the Youngstown area), and the three candidates have different white ethnic last names: Schiavoni (Italian), O’Neill (Irish), and Kucinich (Croatian). Northeast Ohio is filled with the descendants of southern and eastern European immigrants, people who helped make the region Democratic in the New Deal era, and Irish surnames are common in Northeast Ohio, too (in fact, they can be crucial in judicial races, where party labels are unhelpfully omitted from the ballot, leaving voters to resort to rather unsophisticated means to make up their minds). Schiavoni, in particular, seems likely to do well in the parochial Mahoning Valley, the typically Democratic region he calls home that includes the struggling post-industrial cities of Youngstown and Warren and that turned hard to Trump. Schiavoni likely also has appeal in other one-time Democratic but Republican-trending areas down the Ohio River, like Steubenville, and he has fans in other parts of the state even though he seems destined to finish well behind Cordray and Kucinich overall. In a two-way race, these are places that might prefer Kucinich over Cordray but where in a multi-candidate field Schiavoni might end up pulling more from Kucinich. Cordray must do very well in his Franklin County home base, where he has the support of the well-organized county Democratic Party. Unlike the Republican race, where millions have gone into negative ads, the Democratic race has been nasty in joint public appearances but not really on the television airwaves. Observers were waiting to see if Cordray would attack Kucinich through television ads as an indication the frontrunner was worried, but as of this writing (Wednesday afternoon, or six days before the primary) Cordray has not. Whether the better-funded Cordray should have gone hard negative will be an easier question to answer on May 9. Attack ads have made a late appearance in the Democratic race, though: A pro-Trump Republican is behind ads attacking Cordray for not being liberal enough for Ohio Democrats in a seeming attempt to indirectly lift Kucinich, BuzzFeed reported Wednesday afternoon. As it stands now, Cordray is in a similar position to DeWine: Favored to win the nomination, but not a 100% lock. If the race does come down to DeWine and Cordray, it would be a rematch of their 2010 race for the attorney general’s office. DeWine would have a name ID and money edge, in all likelihood: Cordray is no slouch as a fundraiser, but DeWine has a nearly five-to-one cash on hand edge already, and that doesn’t even include the advantage the Republican Governors Association often can muster over its counterpart, the Democratic Governors Association. Working in Cordray’s favor would likely be at least some advantage from the national political environment, and other circumstances dealing with state government may be conspiring in his favor (more on that below). Note: Click on each map to see a larger image. Democrats generally need to do very well in Cuyahoga (Cleveland) and Franklin (Columbus) counties, and in recent times, winning Hamilton County (Cincinnati) has become essential. Those three big urban counties that are at the heart of, respectively Northeast, Central and Southwest Ohio, cast close to 30% of the total statewide vote. 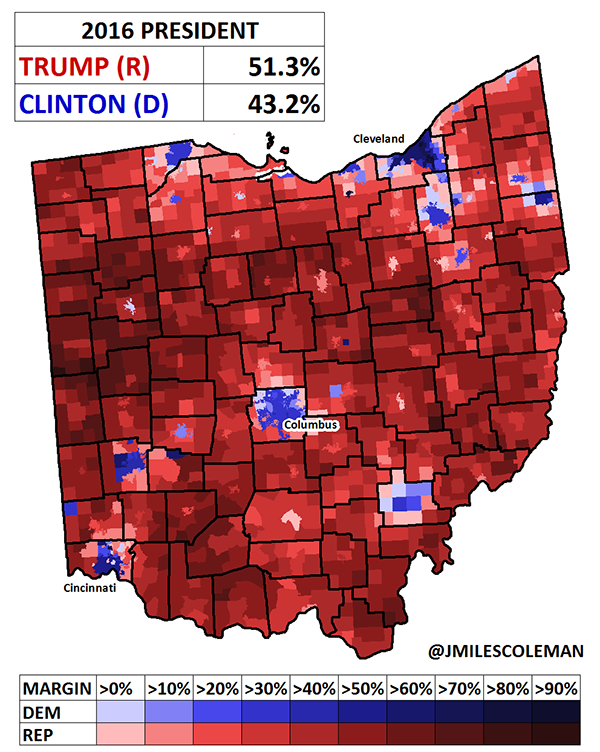 As is clear from Map 2, which shows the Hillary Clinton-Donald Trump race in Ohio from 2016, Clinton did fine in those places as a whole, lagging in Cuyahoga but making up for that in Franklin and Hamilton, but she struggled almost everywhere else, running well behind typical Democratic margins in places like the Mahoning Valley and throughout all of eastern, Appalachian Ohio. She also won but underperformed in places like Lucas County (Toledo) and the very Democratic but lightly populated Athens County, home of Ohio University in Southeast Ohio. Just to put the long Democratic lean of these places into perspective, they were the only two counties that George McGovern carried in Ohio in 1972. Clinton — and Cordray in 2010 — also lost Montgomery County, home to the city of Dayton, in 2016. Typically, Montgomery County votes at least a little bit to the left of the state as a whole, meaning that a Democrat who can’t carry Montgomery probably isn’t winning statewide. That was true for Clinton and for Cordray, although in the latter case there were extenuating circumstances. DeWine is from Greater Dayton — his first elected job was as the county prosecutor in Greene, the county that borders Montgomery. Husted, too, is from the Dayton area. One would expect this region to perform more strongly for the DeWine-Husted ticket in the fall than it might for other Republicans, again assuming that ticket is nominated. Of course, winning or losing counties doesn’t matter at the statewide level, but if DeWine-Husted were to overperform in Greater Dayton, Cordray (or Kucinich) would have to make up those votes elsewhere. While Cordray stylistically is not a folksy, charismatic Appalachian Democrat — he’s actually about as far away from that kind of politician as one could be — Democrats can and probably need to still compete for votes in that region. 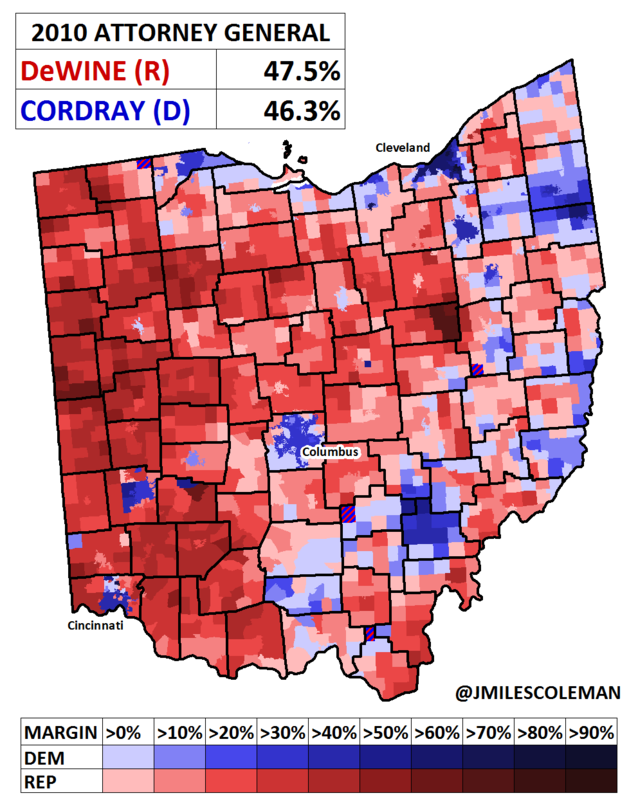 Cordray did in 2010 to some degree, as is clear from the map. Clinton did not. Cordray’s unwillingness to meet Kucinich on the left on the gun question may be rooted in a desire to mitigate the gun issue in the culturally conservative Appalachian parts of the state where Democrats need to perform at least passably. Cordray also needs a big number from his home base in Columbus, and he should be able to get it given Franklin County’s strong Democratic turn in recent years. If there’s a Democratic turnout surge in Ohio, it may hit the hardest in Franklin County, where state government plus Ohio State University plus well-educated and affluent suburbs could combine to produce a very strong Democratic result. Assuming there is a Cordray-DeWine matchup in the fall, there will be plenty of time to dig deeper into it. As of this writing, we give the GOP nominee a small edge, hence our Leans Republican rating, but we may reassess after the primary, particularly if Kucinich or Taylor (or both) spring an upset. Sharing the ballot with the Democratic nominee will be Sen. Sherrod Brown (D-OH), who seems like at least a small favorite against the likely Republican Senate nominee, the aforementioned Renacci. The four-term congressman faces some other challengers for the nomination, most notably businessman Mike Gibbons, who has run a spirited race but does not seem likely to emerge. (Then again, no one should be shocked if an outsider businessman wins a Republican primary.) Brown, a populist whose anti-free trade script Trump borrowed to great effect in eastern Ohio and in other parts of the Midwest, appears to start his race ahead. Renacci can self-finance, but in what is a target-rich environment for Senate Republicans, it does not seem like some national Republicans are highly prioritizing the race. However, the White House might be, given the president’s support for Renacci’s campaign and his laser-like focus on the state (Trump is holding another event in Ohio on Saturday). In terms of our ratings, we’re at Leans Democratic, and the race seems closer to Likely Democratic than to Toss-up. But with Ohio changing, Brown cannot leave anything to chance. Here again, Brown will have to significantly improve on Clinton’s performance in Eastern Ohio. The stakes for Ohio Democrats are high in the Senate race: Democrats could be excused for losing to DeWine, who is a state institution and who at the very least seems likely to have a resource advantage. But if Brown were to lose, that probably would mean Democrats were also getting swept in all the statewide races, which would lead one to question under what circumstances Democrats could win in Ohio again. As it stands, Republicans have largely dominated state government since 1991, including holding the governor’s office for what will be 24 of 28 years by the end of term-limited Gov. John Kasich’s (R) tenure. The governor is a man without a party. Kasich remains broadly popular in Ohio, making up for a conspicuous drop in Republican support since his refusal to support Donald Trump in 2016 by boosting his standing among Democrats, who are attracted to him for the same reason some Republicans are repelled. If Kasich were on the ballot this fall, he would likely be reelected; if he were on the primary ballot next Tuesday, he might not be renominated. Both DeWine and Taylor have kept Kasich at arm’s length in the primary and have questioned one of his signature achievements, the Medicaid expansion made possible by the Affordable Care Act (Medicaid expansion seems likely to be a flashpoint in the fall). The governor certainly is making many of the moves one would expect of a potential presidential candidate. He may be more noticeable in New Hampshire this fall than in Ohio, where despite his popularity neither nominee seems likely to embrace him. Kasich has done DeWine (or Taylor) a favor by leaving him a state government that is by and large running functionally and not mired in scandal. Or is it? Ohio Republicans will be electing a new House speaker on May 15 after the former speaker, Cliff Rosenberger (R), resigned under the cloud of a reported FBI investigation. Reports indicate the FBI is looking into some travel and other perks that Rosenberger received from lobbyists and other groups with an interest in Ohio’s lawmakers. The contest to succeed Rosenberger already was vicious: Two Southeast Ohio House Republicans, Ryan Smith and Larry Householder, have been waging a battle for the speakership for more than a year. A recent Householder primary ad, featuring him shooting a television while wearing camouflage, makes him seem like an outsider, per the familiar, recent GOP script. But Householder actually is an immensely powerful insider who served as the state House speaker in the early 2000s. Bloody primaries with proxy candidates for either speaker possibility are being waged across the state. Smith claims he has the votes to win the May 15 vote to be speaker for the rest of this legislative session; even if he does, the battle may rage on until the new House opens early next year, when the GOP caucus is likely to be both different and at least a little smaller (more on that below). So the speaker elected in mid-May might not be the speaker a year from now. Another GOP primary wrinkle comes in the state treasurer’s race, where a perennial candidate, Sandra O’Brien, might beat the favorite of most state Republicans, state Rep. Robert Sprague. Those who have never heard of O’Brien, who Cordray easily defeated in his first statewide victory in the 2006 state treasurer’s race after she defeated an appointed incumbent in a primary upset, might think of her as Ohio’s version of Sharron Angle, the firebrand Nevada Republican who surprisingly won the 2010 Senate nomination before losing to then-Senate Majority Leader Harry Reid (D). One other notable down-ballot statewide candidate is Zack Space (D), who served in the U.S. House from 2007 to 2011 and is now running for state auditor. One wonders if the unfolding Rosenberger scandal and the various primary battles on the GOP side will conspire to give Democrats yet another assist in a state that typically seems to prefer a Republican-run state government. Ohio, like so many other states, has state legislative and congressional maps that unquestionably favor Republicans. Following the 2010 election, when Republicans picked up five Democratic seats en route to a 13-5 majority in the state’s U.S. House delegation, state Republicans designed a congressional map that would elect a 12-4 Republican delegation (the state lost two seats during reapportionment due to slow population growth). The map has performed as planned for three straight cycles. Meanwhile, the Republicans have veto-proof majorities in the state Senate (24-9) and state House (65-33). (Veto overrides require a three-fifths vote in Ohio, so 20 votes in the Senate and 60 in the House.) Veto-proof majorities may not have been the explicit goal of the gerrymanders — horrible Democratic campaigning in Ohio in 2014 and 2016, including an effective abdication of the governor’s race in 2014, contributed to that — but big majorities definitely were. State observers expect the Democrats to pick up state House seats this year, perhaps a half a dozen or more. Part of that is just a natural erosion of the Republicans’ huge current margins. Still, the next speaker seems very likely to be a Republican, but his caucus is likely to look substantially different than it does now. Democrats probably don’t need to win any extra seats in Ohio to take the U.S. House, based on a plan of attack we sketched out a few months ago, but they have the potential to win one or more. The one that merits the closest attention at the moment is OH-12, a vacant Central Ohio seat previously held by ex-Rep. Pat Tiberi (R). We explored the history of this district in depth in mid-March, and those curious about its history should look back at that piece. There is yet another hot primary battle on the GOP side, with Tiberi using some of his war chest to back state Sen. Troy Balderson (R), while Melanie Leneghan, a township trustee in the district, is running to the right (there are other candidates capable of winning the nomination, too). Some Republicans worry Leneghan might kick away the seat if nominated, although in any event it seems likely that OH-12, a historically Republican district that Trump won by about 11 points, will be a Democratic target in an August special election. The Democratic frontrunner is Franklin County Recorder Danny O’Connor (D), although he too faces a big field of other Democratic contenders. In our mid-March update, we questioned the ability of Democrats to truly compete for this seat because of its longstanding Republican lineage, but a strong Democratic showing in AZ-8’s recent special — the Democrat lost by less than five points in a solidly Republican district that Trump carried by 21 points — is an indicator that OH-12 should be an extremely competitive race. The other strong Democratic target is in Cincinnati, where Rep. Steve Chabot (R, OH-1) faces what should be a spirited challenge from Hamilton County Clerk of Courts Aftab Pureval (D), a candidate who Democrats discuss with excited delight. The district melds much of Cincinnati with highly-educated but usually blood red Republican suburbs, and Trump won it by about a half-dozen points. Chabot, who only raised only about $171,000 last quarter, may not realize the predicament he is in (Pureval raised about $660,000). Democrats may have an outside shot to compete in Renacci’s open OH-16 — where a primary similar in style to OH-12 is being waged between state Rep. Christina Hagan (R) and former Ohio State and NFL football star Anthony Gonzalez (R), with Hagan running to Gonzalez’s right — as well as against Reps. Bob Gibbs (R, OH-7), David Joyce (R, OH-14), Steve Stivers (R, OH-15), or Mike Turner (R, OH-10). Democrats may not win any of these seats: Our ratings still favor the Republicans in all six of these races, although OH-1 and OH-12 may drift to Toss-ups before too long. But here too is how Ohio reflects the nation this year: Republican-drawn House maps across the country largely held up in 2012, 2014, and 2016. But they weren’t really pushed in any of those years: In terms of House elections, 2012 and 2016 were basically neutral years in the House, and 2014 was a clearly Republican year. This year, GOP maps in Ohio are going to be pushed at least harder than they’ve been before by Democratic pressure, and potentially much harder. Will they perform under stress? 1. Kondik worked for Cordray when he served as Ohio attorney general from 2009-2010. Kondik’s book on Ohio’s presidential elections, The Bellwether, was released in 2016 by Ohio University Press.